Bohemian decor has quickly become one of the most popular current design trends. It’s defined by artistic and creative spaces. Popular elements are woven rattan, a mixture of global-inspired prints and patterns, and layers of textures. While this style may feel bold in some rooms, we love how inspiring the look of bohemian nurseries are. When decorating a nursery, you can go with a theme and strong point of view, as the space will be temporary until your child grows. 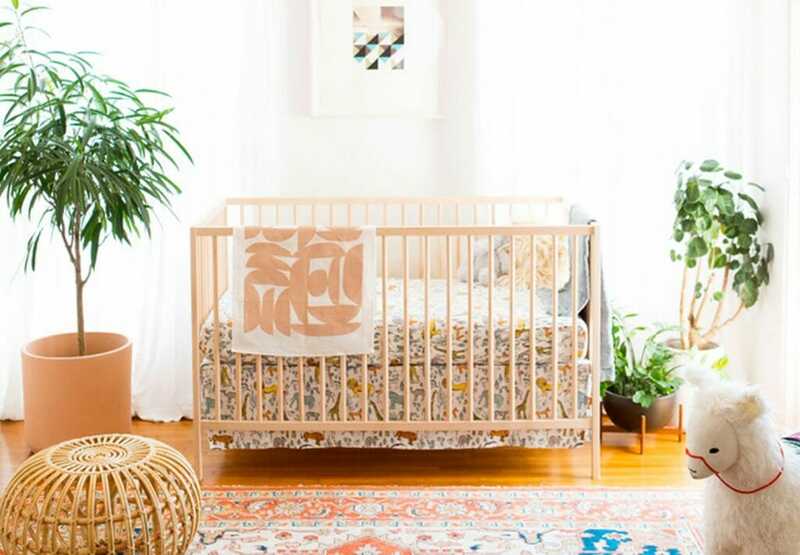 We rounded up our top 5 inspiring bohemian nurseries, in a range of color and design, to share with you! For an eclectic twist, check out our post on gender-neutral eclectic nurseries as well! Layered rugs in varying patterns are a popular element of bohemian design. In this nursery, we love the soft pinks in these mixed rugs. 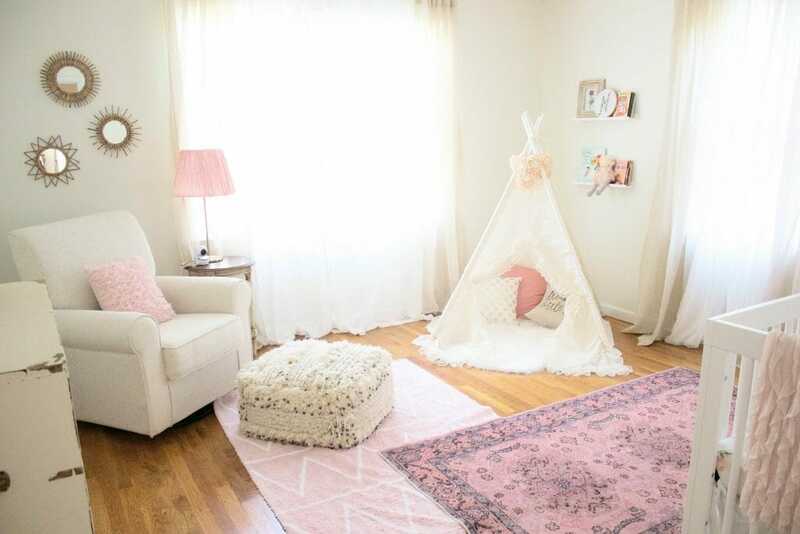 The collection of rattan mirrors, global-inspired Moroccan pouf, and sweet teepee add boho touches to this feminine nursery. Check out the entire room tour for even more loveliness. Design by Decorilla online interior designer, Laura A. This design rendering from Decorilla designer Laura A. would be the perfect room to add some of these pink and girly bohemian design accents! 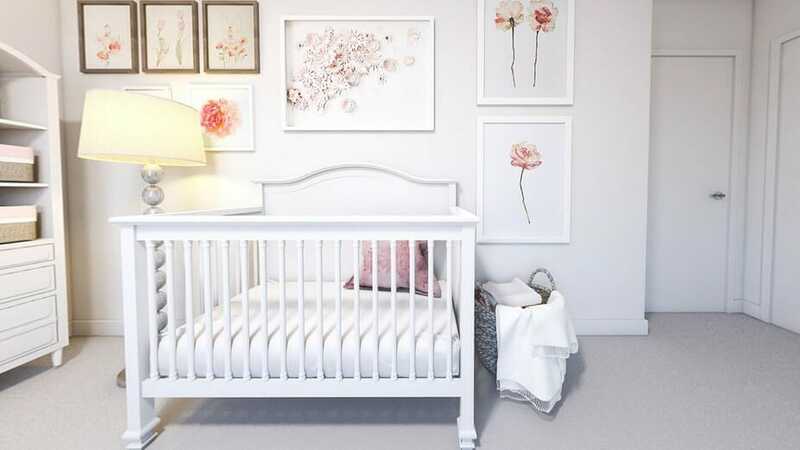 Check out the full nursery design to see all the gorgeous details. Between the chunky knit poufs on the floor to the over sized art on the walls it’s the perfect place for an imagination to run wild. 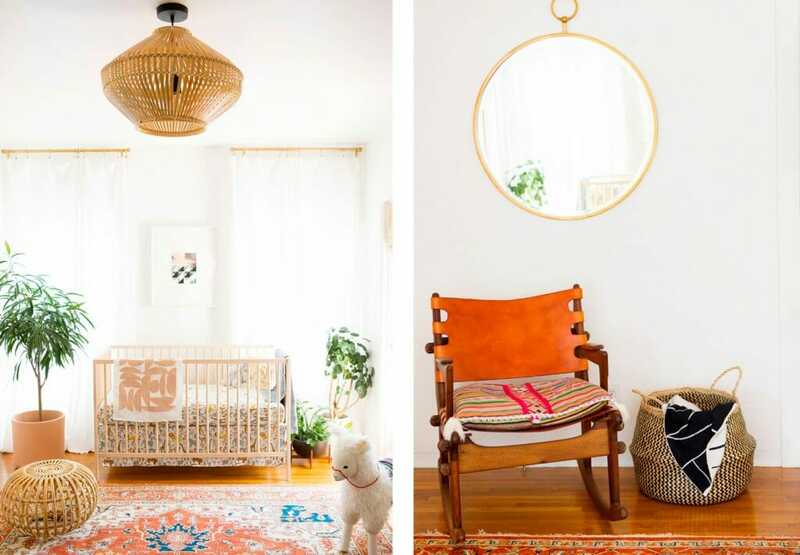 Bohemian nursery style doesn’t just have to be for girls. This neutral nursery feels cool and modern. Cozy and boho textures, like the bold rug, woven pouf, and fresh greenery add natural elements and style. This playful space has so much to love- the global-inspired textiles, tons of plants, and rattan, the earthy vibes feel bright and the colors, natural. A great way to incorporate bohemian style into a boys nursery is with the color of the moment, indigo. This pigment-dyed textile is fresh, casual, and adds a global and collected feel to any room. We’re swooning over the layers of rugs, blankets, and that wall hanging. A rattan pendant and basket add even more natural touches. 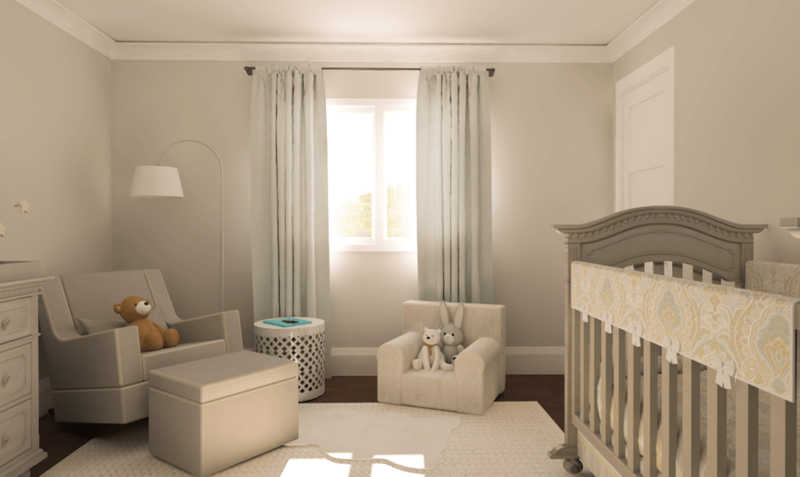 Cozy textures are abundant in this neutral gray nursery. We love the pattern in the rug, the knit pouf, and fun boho pillows. The wow factor in this room comes from the tribal-inspired patterned wallpaper. An over sized wall hanging pops beautifully in this pretty bohemian room. 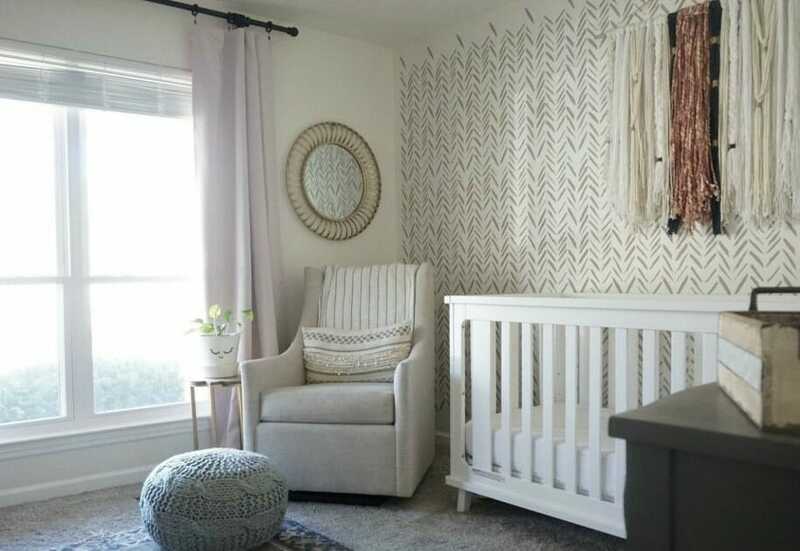 This soft gray nursery by Decorilla designer Eleni P. features lovely bohemian patterns in the rug and crib bedding. To have a bohemian nursery it doesn’t have to be full of color as one may think, they can be gender neutral as well as color neutral! Bohemian nurseries can be bold, too! This black and white nursery has a shag rug in a bright, global pattern. The weaves in the pillow and baskets feel fresh and cozy, and we adore the wood beaded chandelier- it adds the perfect pop of bohemian style. There is so much bohemian nursery inspiration out there showcasing a range of eclectic, global style. If you’re looking to add some decorative elements to your space (whether it be for you or your littlest loves), check out HGTV’s guide for incorporating cozy boho decor. If you’re starting from scratch instead, our online interior designers are ready to help you today!